This poster actually came out on New Years day, prior to the launch of the hotly-debated one featuring David Cameron, however I only came across it for the first time yesterday on a huge site in Shepherds Bush. 1) It’s so painfully unoriginal. There are too many brands/people/pressure groups to name who have projected something on to The Houses of Parliament. 2) It’s unbranded. Nobody outside of the political elite will know who this poster is for. 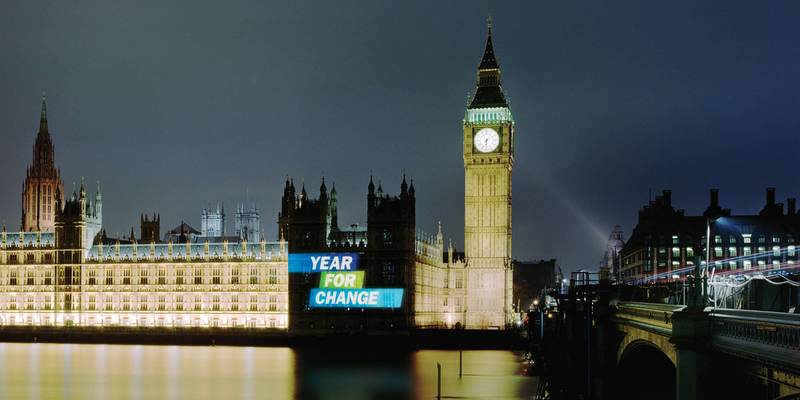 The Conservative’s “…for change” logo is far from embedded in the minds of the British electorate. I get that it’s meant to tease, but this will leave most people completely cold. 3) ‘Time for change’ is pretty much the only message opposition parties can opt for, so you can’t really criticise that. However, I don’t think the electorate are so clear to what the Conservatives’ are going to change that the ‘year for change’ claim can be made without some sort of justification.